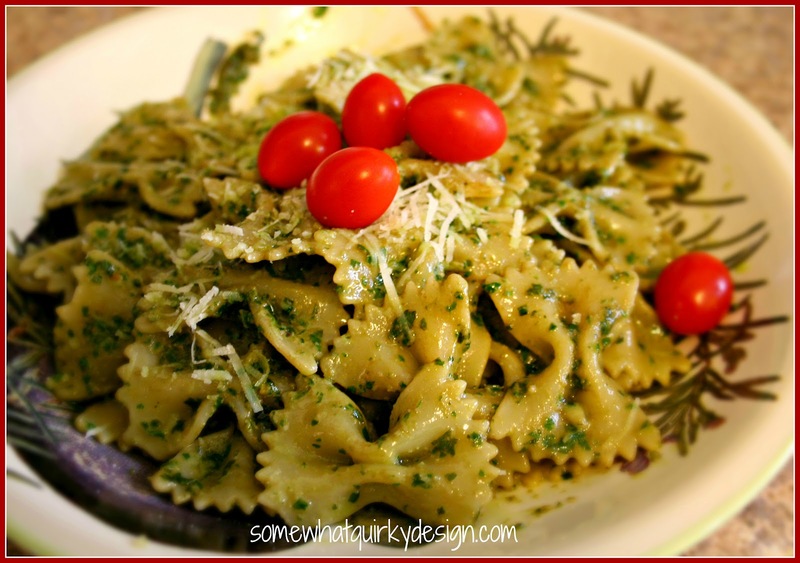 Somewhat Quirky: Pesto! Pesto! Pesto! While all you guys are out doing those summer activities that you enjoy - like boating, swimming, golf playing, softball playing, traveling, ..... I am home growing basil. I grow lots of basil. I very lovingly grow lots of basil I would name my basil plants - but I'm afraid that then I wouldn't want to eat them. I like basil. 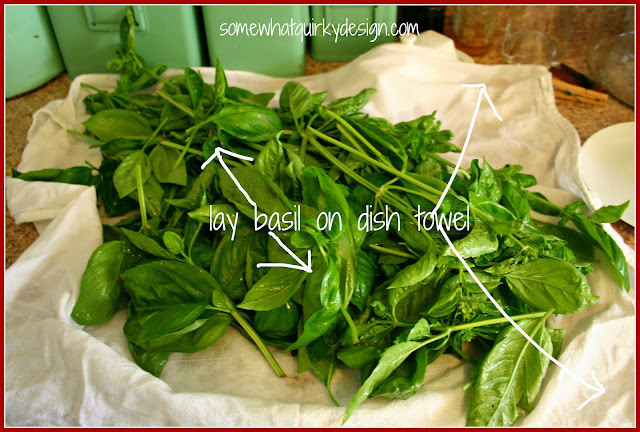 I like basil because it is the main ingredient in pesto. To say I like pesto would be a bit of an understatement. I like pesto on pasta. I like pesto on sandwiches. I like pesto on vegetables. I like pesto on sandwiches. I like pesto on pizza. I like pesto on bread. I like pesto by the spoonful. Get it? Actually I must qualify this. I like MY pesto. In case the word hasn't reached your part of the world yet, I will tell you. I make some DAMN GOOD pesto! Even the Italians think I make good pesto. I take my pesto making very seriously. 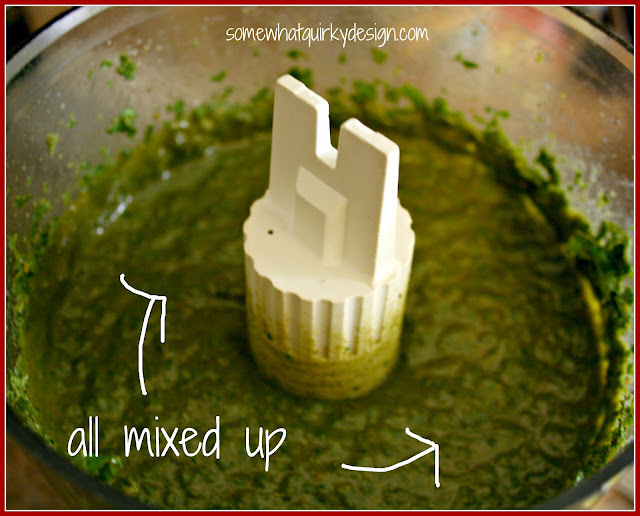 Today I'm going to share all my pesto making secrets with you. My first few years of pesto making I was very naive. I thought I knew all there was about making pesto. I thought that just throwing all the ingredients into the food processor and grinding them up was enough. Perhaps it is. But then - I read the book. The Americas's Test Kitchen Cookbook. They have three - THREE!- pages of information about the ins and outs of making good pesto. I tried it. Consequently, I am able to make pesto that is consistently delicious. So very delicious. But before I break my arm patting myself on the back I will get to the point(s). First you have to have basil. TIP #1 - Don't let your basil bud. Buds make your basil turn bitter. 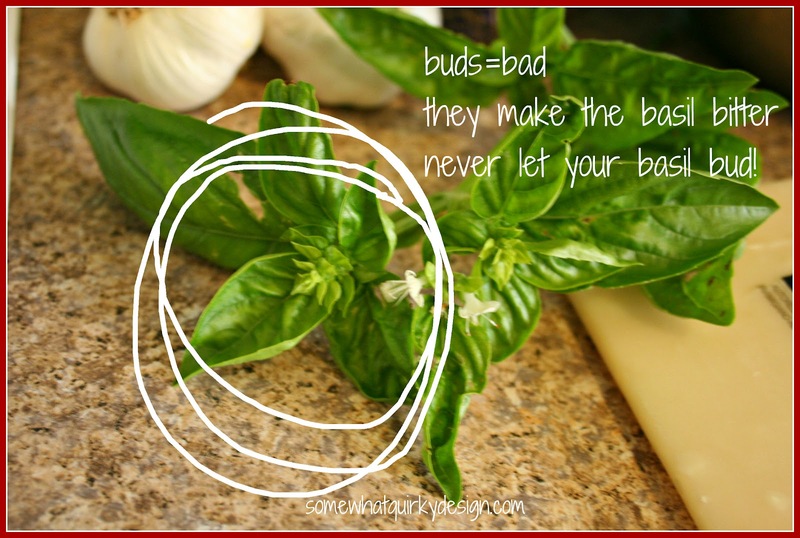 If you are growing basil, keep the buds pinched off. If you are buying basil, buy the bunch with the least buds. Bring your dry basil inside and pick all the leaves off the stems. This is the part of pesto making that takes the most time. I like to sit on the couch and watch television while I do this. Depending on how much pesto you are making, this can take a long time. 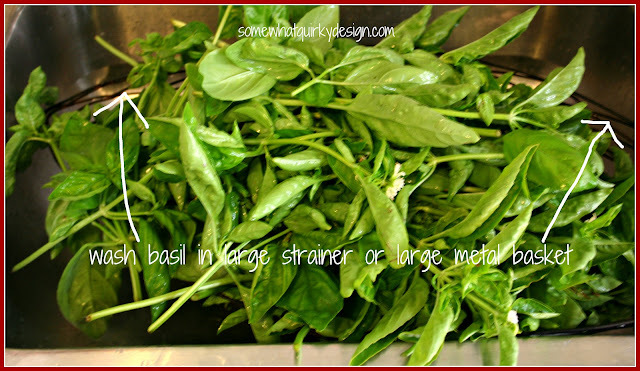 Tip #3 - Use scissors to clip the leaves off because pinching a million basil leaves off stems turns your thumbnail black. Now all the hard parts are over. The rest is a breeze. FYI - recipe is below tips section. If you think you know everything you want to know already, fast forward till then. 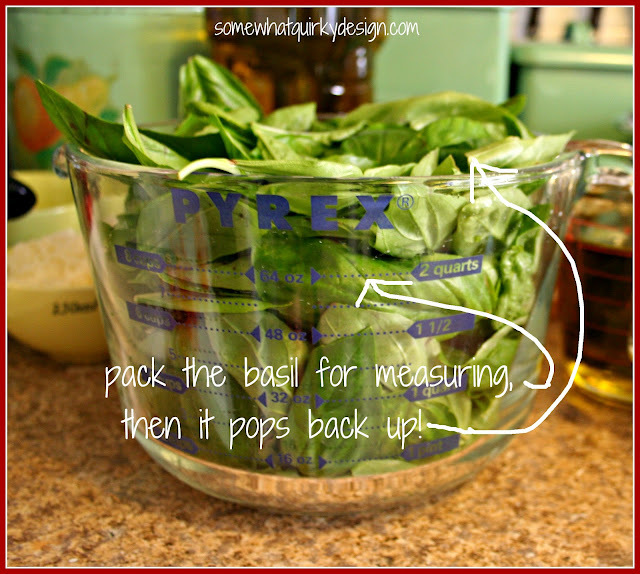 Tip #4 - Pack your basil in pretty firmly. It will pop back up and look like you have too much but don't worry your pretty little head about that! 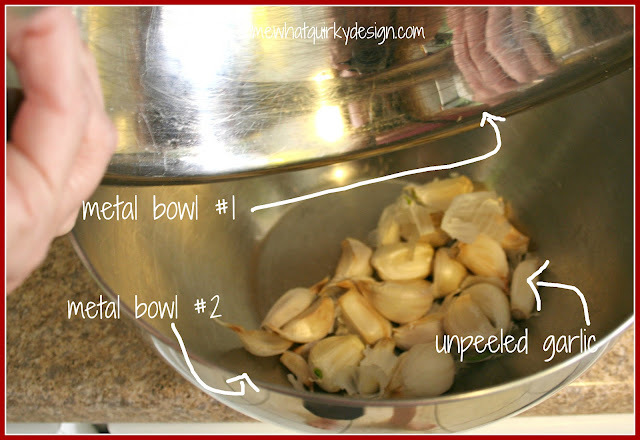 Tip #5 Put your garlic cloves into a metal bowl. Cover that bowl with another metal bowl. Shake. Shake hard. Shake again. Shake a bunch. Eventually all the garlic skins will come off. It's a miracle. Tip #6 If you don't have very much garlic to peel and you happen to have metal lids for your cookware, you can use these lids the same way you would use bowls. Tip #7 - BLANCH YOUR GARLIC!!!! This is a game changer. The garlic will be slightly less bitter and a slightly sweeter when you blanch it. Place your peeled garlic in boiling water for 35 seconds. JUST 35 seconds) Remove garlic with a slotted spoon or strainer and immediately put in ice water. This stops the cooking process. 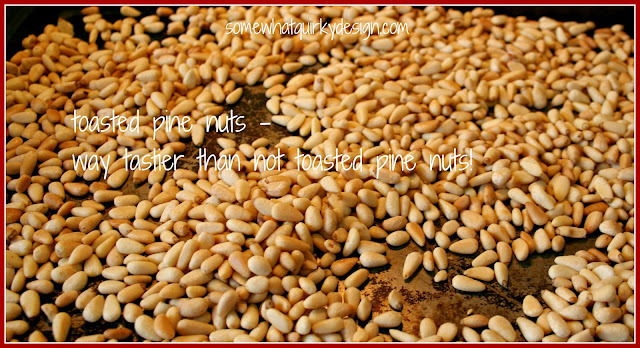 Tip #8 - Toast the pine nuts (or whatever nut you are using) Spread nuts on cookie sheet and bake at 350 until slightly browned. In my oven oven this takes 5-7 minutes. You can also toast pine nuts in a small heavy skillet over medium heat, stirring frequently until just golden and fragrant. 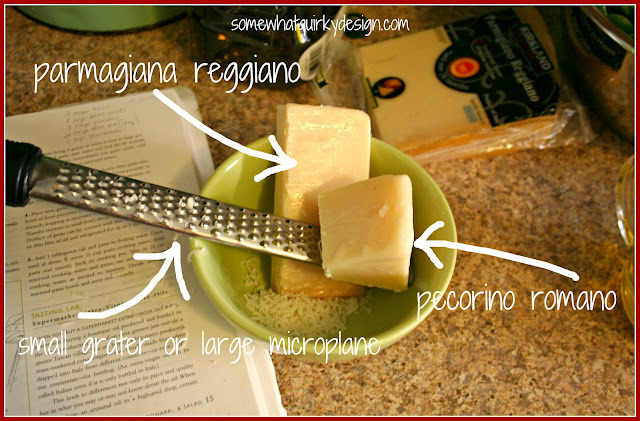 Tip #9 - America's Test Kitchen recommends a mix of parmagiana reggiano and pecorino romano. That is what I do when I have it. Try not to grate your cheese to the point of powder. It is best when it has a little texture. 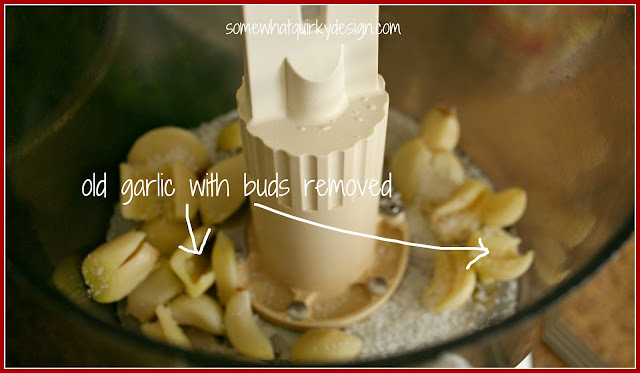 Put your blanched garlic into the food processor with salt. Process a few seconds until garlic is mostly mashed. Add parsley and pine nuts. Process. 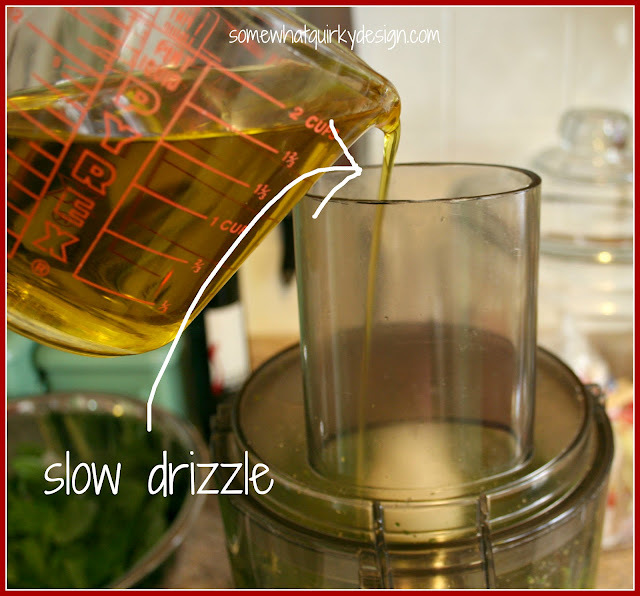 Turn processor on and slowly drizzle in the olive oil. Tip #10 - Consumer reports found Kirkland extra virgin olive oil to be the best non-artisanol olive oil. Tip #11 - Americas test kitchen found Davinci to be the best supermarket brand. This was in 2001 so a lot could have changed since then (like the opening of Costco!). When it is all mixed up, turn off the processor. Pour mixture into a bowl. 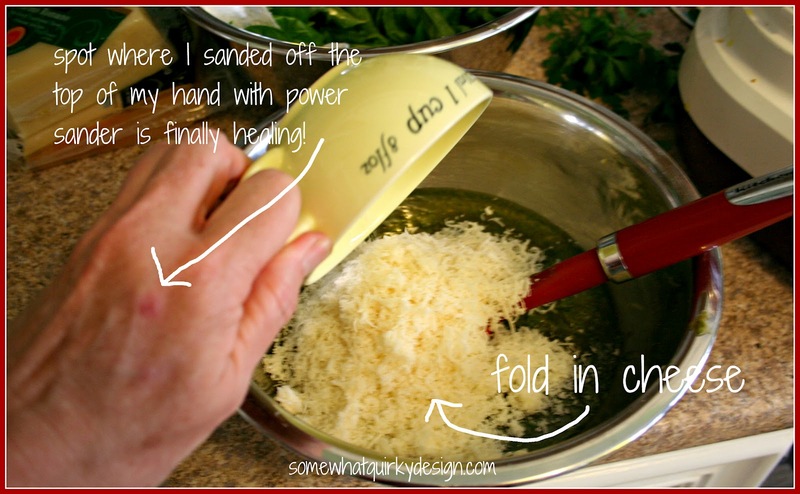 Fold in the grated cheese. The pesto is ready to eat! Tip #12 - Put pesto in small jars (4-8oz) and give them to your friends. They will love you forever and invite you to all their parties. Tip #13 - If you don't have friends or want to hog it all have some for later pesto can be frozen. I make a bunch and freeze it in freezer bags in one cup portions. Now, what I do is put water on to boil for pasta about the time I need to blanch my garlic. That way I have water for blanching the garlic and water to cook pasta in. 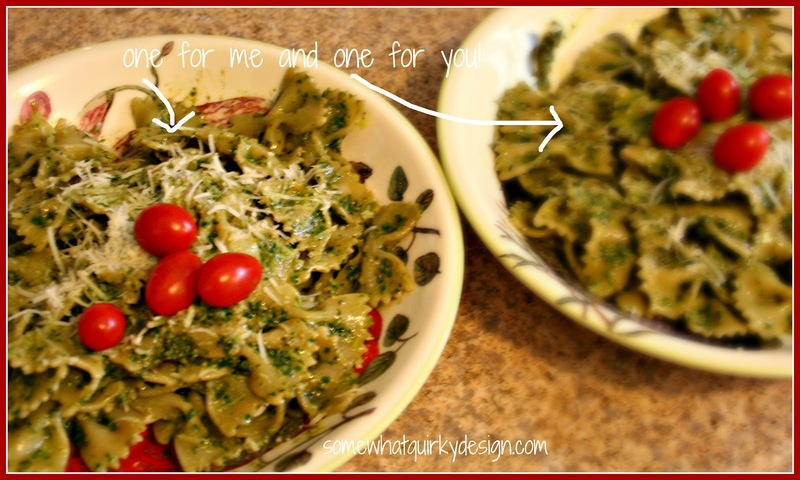 Pasta that is going to give me an excuse to eat pesto! Tip #14 - Pesto is best served on pasta that has a bunch of surface area and wrinkles for the pesto to get stuck to. Note: ignore amounts you see in pictures - I usually make 4 recipes at a time. Bring water to boil in pot. 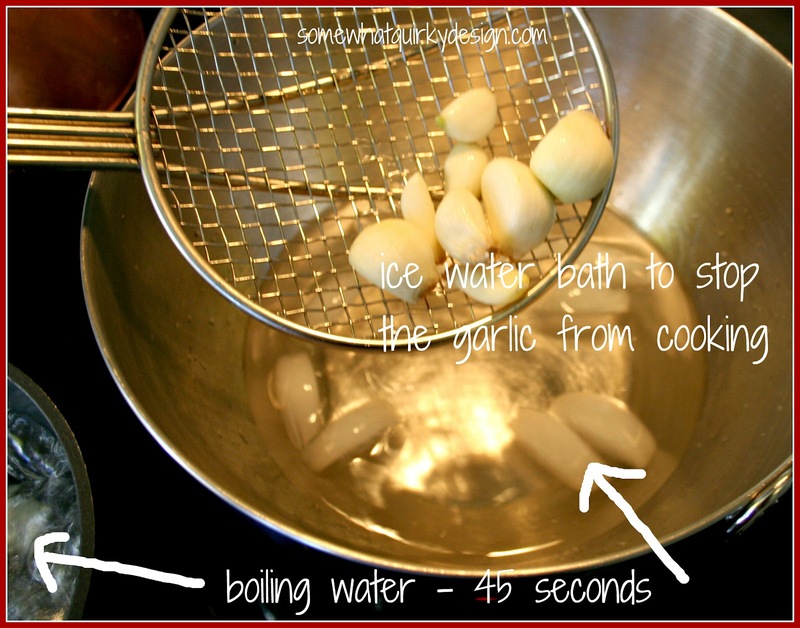 Lower garlic in water for 35 seconds. Immediately put in ice water or under running cold water. Place 1/2 tsp salt and garlic in processor fitted with steel blade. Process until garlic is minced. 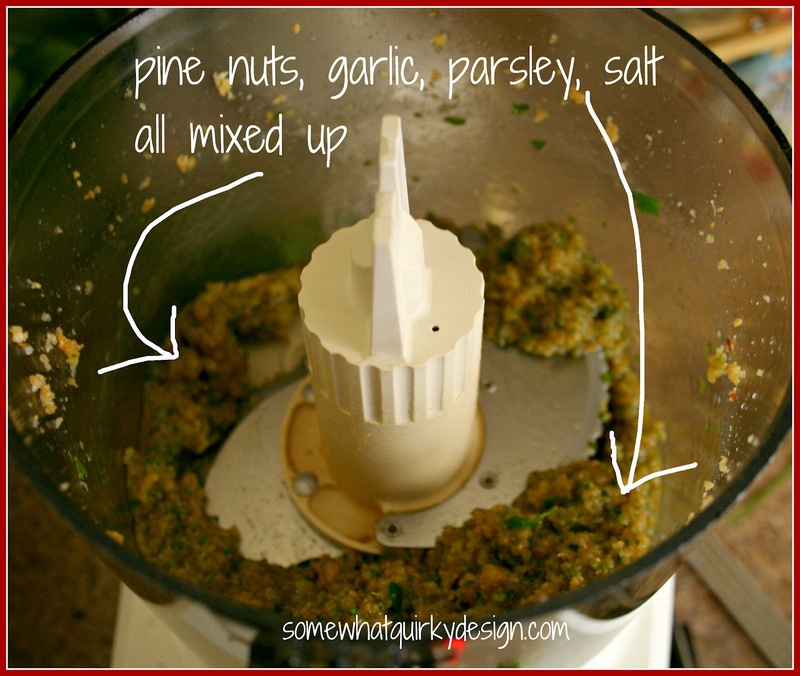 Add parsley and pine nuts to process. Process until fully incorporated. Add basil to processor. Process until smooth, stopping as necessary to scrape down sides of bowl. 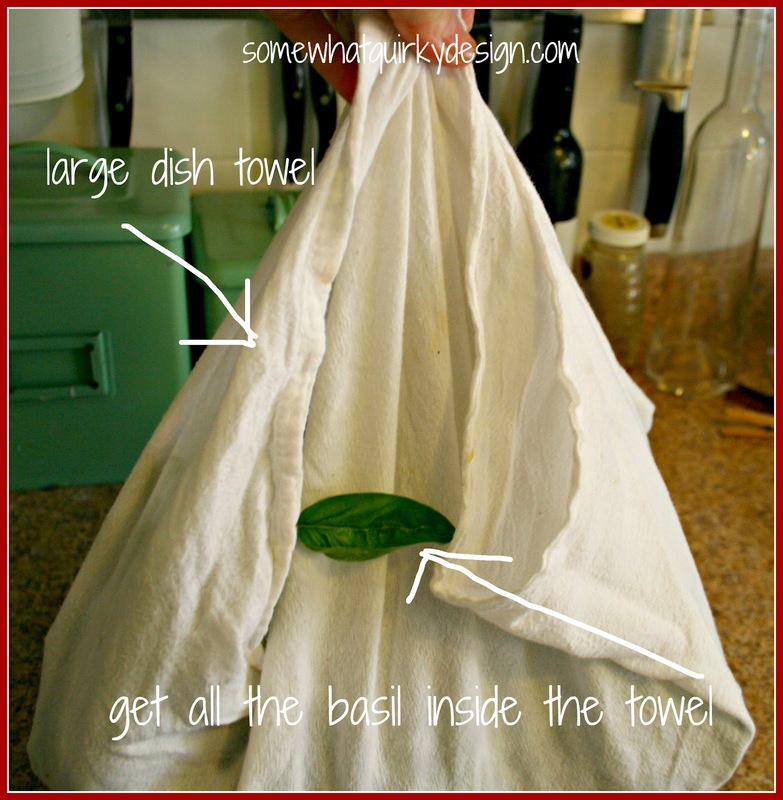 If not using soon, lay a sheet of plastic wrap over surface or cover pesto with thin layer of olive oil. Make this - or something wonderful today! 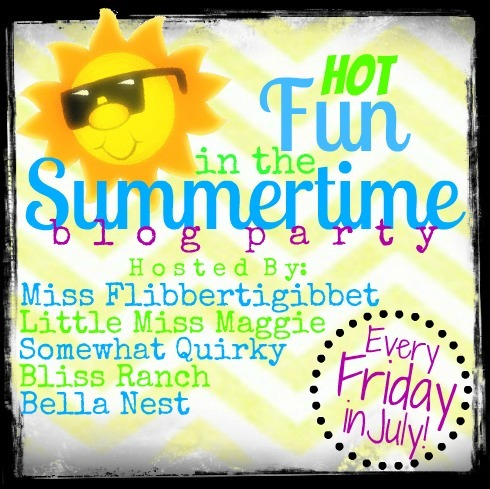 Don't forget we will be partying again here on Friday! Party starts at 8 PM on Thursday. See you there! Stop in tomorrow for features from last week's party! Yum! I've thought of making my own pesto but haven't tried. Maybe now I will! 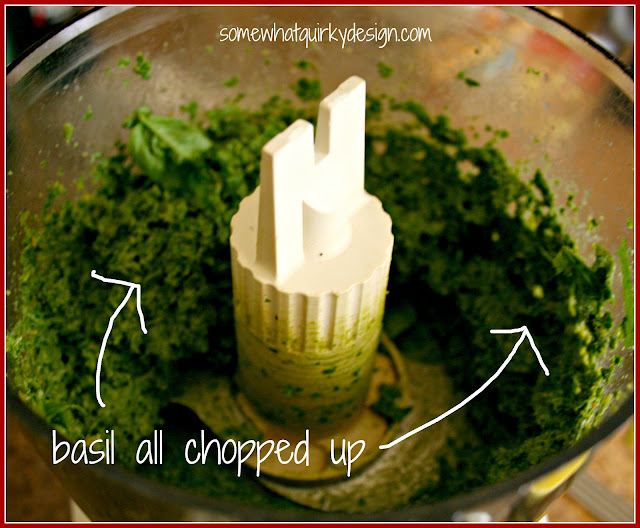 One favorite pesto recipes is Pesto Chicken Pockets. I use Pillsbury Biscuit dough, roll them out and fill them with pesto, cooked chicken breast, and mozzarella cheese. Then bake for about 8-10 min. Yummy and quick! The garlic peeling thing is freaking magic. I figure there must be little elves or something in there that make it work. Seriously. There you go again, messing with my diet. I'm pretty sure pesto is not a Weight Watcher favorite but that's probably why I'm on this plan for the umpteenth time. I love pesto on anything. One of my favorites. Freezing it is a good idea too. I'm so impressed you grow your own. That probably makes it better from the get go too. Much fresher that way. Hold onto your basil because you are not going to like or believe what I am about to say. ...I have never tried pesto... That's about to change. You have convinced me that I have been missing out on one of the finer things in life. Loved this post and your sense of humor. Great pics--everything looks so bright, pretty, fresh and delicious! 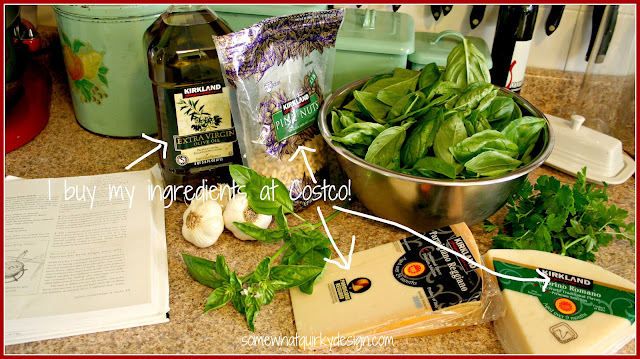 Great tips on making pesto! I love America's Test Kitchen, too, and Costco. Thank you for the great tips.....love your photo's.